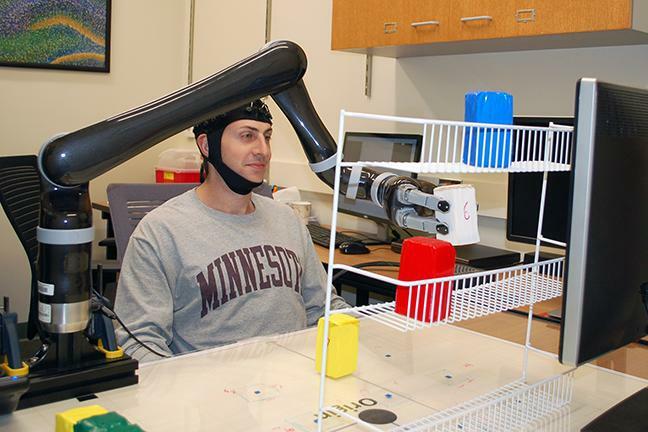 Researchers at the University of Minnesota have developed a brain-computer interface (BCI) that allows humans to control robotic arms using only their thoughts. “This is the first time in the world that people can operate a robotic arm to reach and grasp objects in a complex 3D environment using only their thoughts without a brain implant,” Bin He, a University of Minnesota biomedical engineering professor, said. He is also the co-author of the study “Noninvasive Electroencephalogram Based Control of a Robotic Arm for Reach and Grasp Tasks” published in the Nature journal. BCI is a group of emerging technologies that aim to bridge the gap between the human brain and the human limb. BCI technologies have the potential to help those who suffer from severe neuromuscular disorders or damage to the motor system. The researchers used an electroencephalography (EEG) based BCI that records the electrical activity of the subjects’ brain using specialized EEG cap fitted with 64 electrodes. The University of Minnesota researchers demonstrated that 13 healthy subjects were able to manipulate the robotic arm, specifically move and grasp objects randomly in a limited 3D space, and maintained their ability to control the robotic arm over several sessions for the period of two to three months. “To focus on subject learning and interactions with the BCI system, we employed a decoding method with minimal customization for each subject. In the future, optimization of the decoding algorithm for individual users and utilization of signals from source space through cortical imaging rather than from raw EEG signals could be of use for enhanced levels of robotic arm control and might reduce the time required to finish tasks,” the researchers said. The researchers recommended that the use of a high-speed robotic arm – which was absent from the University of Minnesota study – could enhance the control of the robotic arm and further decrease the time required to task completion.